Agent 4 on a ride rail. Ride rail, also known as ride-rail, are a mechanic found in Splatoon 2’s Octo Canyon and Splatoon 2: Octo Expansion. In Octo Canyon, they replace the inkrails from the first game in the campaign, while in Octo Expansion, both can be found. 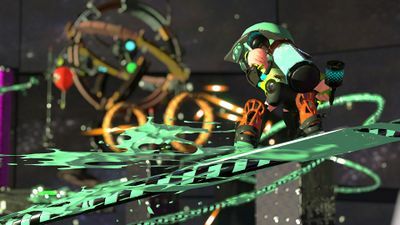 Ride rails act very similar to inkrails in that the player uses these lines of ink to travel and jump further in squid form, but they differ in the fact that the player can grind on the ride rails by turning into humanoid form. Weapons can be used by the player while on a ride rail. Ride rails are one-way, in contrast to inkrails which allow the player to travel back and forth. Ride rails appear to be ropes of ink-covered metal spirals containing ink inside that connect to platforms or are suspended mid-air. They can be activated by the player's ink hitting a slightly larger bulb that is similar to the inkrail bulb but with propellers at the end, or are sometimes activated automatically depending on the player's actions, such as when there are several inactivated rails in a row and activating one activates all of them. The player can hop from a rail to another or a platform by pressing to jump while tilting the towards the direction wanted in humanoid or squid form. Jumping like this can be used to perform tricks in reference to real-world grind rails that are used to perform skateboard tricks by jumping. When using the ride-rails, it is also possible to fall off if the player does not time jumps correctly and misses their landing. The player can get on a ride rail by jumping on it while it's activated, or by dodge-rolling into it with the Dualies by pressing . They can also activate the rail that way. In multiplayer stages where ride-rails appear, they gain additional properties similar to the implementation of inkrails, where both teams are able to activate each ride rail. Activating the ride rails will have the bulb show the ink capacity visually decrease until it empties, which deactivates the rail. Ride rails can only be used by players of the same ink color, where the team can ink the bulb to refuel it, while opponent ink will deplete it faster. In Salmon Run stages such as Ruins of Ark Polaris, ride-rail bulbs can become deactivated during certain phases, being unusable until certain phases. A ride rail that spirals around a tower. Agent 4 on a ride rail, wielding Hero Dualies. Another image of Agent 4 on a ride rail. Agent 8 on a ride rail, wielding Dualie Squelchers. Shifty Station for the Halloween Trick vs. Treat splatfest, which contains ride rails. An Inkling carrying a Golden Egg, riding a ride rail. An unactivated and unusable ride rail, seen in Ruins of Ark Polaris. No inkrails are found in Octo Canyon, due to being replaced by the ride rails, but they have instead been introduced into the multiplayer as an exclusive mechanic. However, this does not carry over to Octo Expansion. "Grinding", a term often used in characters' dialogue when referring to riding a ride rail, is a reference to grinding on a skateboard. Also, if Agent 8 jumps while having no main weapon on a ride rail in an Octo Expansion mission, they will bring their feet up to their side and grab onto them, a reference to a similar move in surfing and skateboarding.